This Retirement Option Election Form allows you to elect the Five-Year Certain or Ten-Year Certain Option. By electing this option, you will receive a reduced retirement benefit. If you die within five (or ten) years from the date of retirement, the reduced monthly benefit will continue to be paid to the designated primary beneficiary for the unexpired balance of the five- (or ten-) year period. This Retirement Option Election Form allows you to elect either the Maximum Retirement Allowance or an option that provides a continuing benefit to your designated beneficiary after your death. By electing a retirement option, you will receive a reduced retirement benefit. Be sure you understand each option, and elect the one that best fulfills your needs. This Retirement Option Election Form is for Tier 2 members who wish to provide a lump-sum income to their designated beneficiary(ies) upon their death. By electing a retirement option, you will receive a reduced lifetime retirement allowance. This Retirement Option Election Form is for Tier 2 members who wish to provide continuing income to their designated beneficiary upon their death. Option 4 provides for a reduced lifetime monthly retirement allowance. Upon your death, a percentage of the reduced monthly allowance or a specific dollar amount will continue to be paid to your designated beneficiary. This application is for Tier 2 members who wish to provide continuing income to their designated beneficiary upon their death. Option 4-4 provides for a reduced lifetime monthly retirement allowance. Upon your death, a percentage of the reduced monthly allowance or a specific dollar amount will continue to be paid to your designated beneficiary. If the designated beneficiary predeceases you, your retirement allowance automatically reverts to the Maximum Retirement Allowance. Option 4 for Tier 1 members provides for a reduced lifetime monthly retirement allowance. Upon your death, a percentage of the reduced monthly allowance or a specific dollar amount will continue to be paid to your designated beneficiary. If you should die after the effective date of your retirement but before you receive your first full retirement payment, a benefit under Option 1 will be paid to your beneficiary. If you prefer that your beneficiary receive payment under Option 4 instead, you must initial the box on the form. This Retirement Option Election Form is for Tier 1 members who wish to provide continuing income to their designated beneficiary upon their death. Option 4-4 provides for a reduced lifetime monthly retirement allowance. Upon your death, a percentage of the reduced monthly allowance or a specific dollar amount will continue to be paid to your designated beneficiary. This Retirement Option Election Form allows Tier 1 members to provide continuing income to their designated beneficiary(ies) upon their death, either as a Return of Reserve (Option 1) or a Lump-Sum Payment (Option 4). By electing a retirement option, you will receive a reduced lifetime retirement allowance. This Retirement Option Election Form is for Tier 1 members who wish to elect the Five-Year Certain or Ten-Year Certain Option. By electing this option, you will receive a reduced retirement benefit. If you die within five (or ten) years from the date of retirement, the reduced monthly benefit will continue to be paid to the designated primary beneficiary for the unexpired balance of the five- (or ten-) year period. This brochure describes the retirement options Tier 3 members, including 22-Year Plan participants. Be sure you understand each option before submitting your retirement forms. 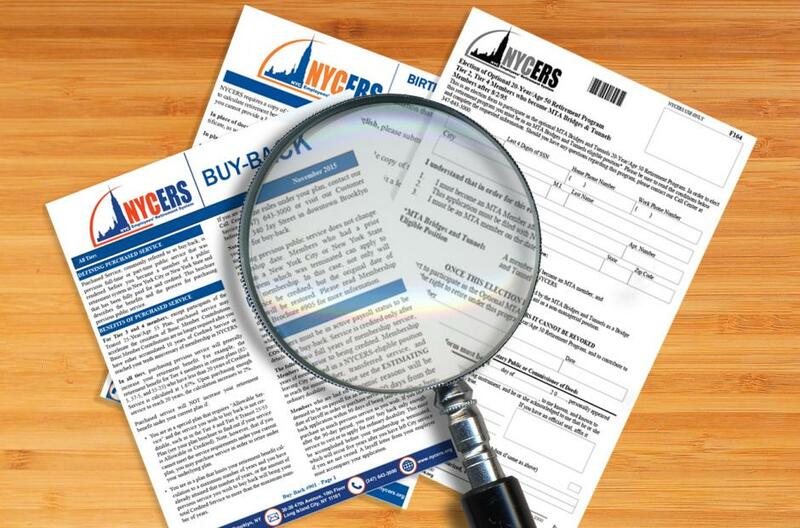 This brochure describes the retirement options for Tier 2 members (members who joined NYCERS after June 30, 1973 but prior to July 27, 1976 and Investigators employed in District Attorney offices who joined NYCERS between July 1, 1973 and March 31, 2012. This brochure describes the retirement options for Tier 1 members (members who joined NYCERS prior to July 1, 1973).